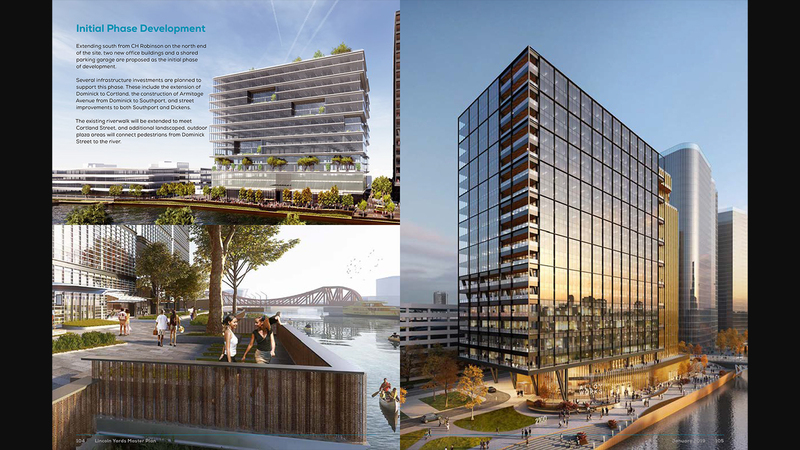 Chicago’s Plan Commission gave a resounding green light to the massive Lincoln Yards development, which promises a “city within the city” between Bucktown and Lincoln Park on the former site of the Finkl steel yard. Backers of the plan – many of whom are affiliated with construction and contracting firms that would stand to benefit from the development, but also 2nd Ward Ald. Brian Hopkins – praised the project with hopes it will transform an industrial wasteland into a vibrant multiuse space with housing, shops, a riverfront walk and park. “I think this is the right thing to do for the city, for my community,” Hopkins said, noting that he’s putting his “name and reputation” on the line for the project. Outgoing Mayor Rahm Emanuel also supports the plan. Even opponents who support development of the area say not like this: Lincoln Yard developer Sterling Bay first presented its plans for the site in July 2018, but its latest – the third iteration – was made public Saturday, less than one week ago. For example, she said the density and square footage of the project grew in the past week – an apparent, unadvertised tradeoff after the developer agreed to do away with a proposed 20,000-seat soccer stadium and large entertainment venue. Smith said the last time such a “momentous decision” was made in such a short time was Chicago’s now much-maligned parking meter deal. Further, Smith said, “new circumstances now cloud this matter” – a reference the recent news that Ald. Ed Burke, charged in a criminal complaint with attempted extortion for trying to use his power on the City Council to drive business to his law firm, had served as the property tax attorney for Sterling Bay. After that became public, Sterling Bay cut ties with him. Other critics’ concerns include what a surge in population will mean for area traffic and schools (something that was not considered by the commission and is not detailed in the developer’s plans), let alone the skyline, given that plans call for buildings more in keeping with downtown skyscrapers than those typical of surrounding neighborhoods (at least one could top 50 stories). Others call it a tax giveaway to a wealthy developer, given that the proposal relies on building roads and bridges with $900 million from a yet-to-be-approved funding tool known as Tax Increment Financing (or TIF) which diverts property tax dollars from regular government needs and instead uses the dollars to develop ostensibly blighted areas. Hopkins first began meeting with local leaders about the property in May 2016, he said, and the top six aspirations for the property that were laid out then are part of the Lincoln Yards vision: an extension of the 606 trail, a new bridge over the Chicago River, modernization of traffic signals at busy intersections, a large park, a river trail and making the property mixed-use. “They listened” to the direction the community wanted to go in, Hopkins said. “To suggest that there is no community process or that it has been so deficient that it can’t be called a community process … it’s insulting to me,” Hopkins said, as well as the seven neighborhood organizations he said he’s been talking with about the space for years. Hopkins said rather than add to congestion, Lincoln Yards will alleviate it, with upgrades to roads, bridges and traffic systems. The Chicago Plan Commission vote is a crucial step, but it is not the final one. The full City Council must give final zoning sign-off.